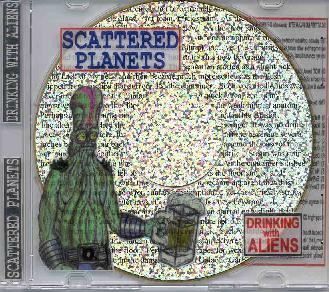 Scattered Planets - "Drinking With Aliens"
Do you enjoy bands stylistically along the lines of Pressurehed and Chrome? Well step right this way. Scattered Planets is the latest project from Doug McMahan, who I first encountered a few years back with his space-surf band Escape Velocity, a fun mixture of Hawkwind and the Ventures. Scattered Planets is more overtly space rock than Escape Velocity was, with McMahan playing dark cosmic tunes that bring industrial and some punk influences to the mix, as well as the feel that you've been transported into the video game you've been pumping quarters into for the past several hours. Songs like "Slaves To The Machine", "Landing Pad", and "No Turns Allowed" are dark and heavy space rockers with the most powerful Pressurehed influences. I love the opening sample on "Slaves To The Machine" with Marvin Martian saying, "Oh drat these computers, they're so naughty and complex. I could pinch them". "Leaving Earth" is a dark but dancey space trip that seems to mix Hawkwind and Ultravox. "Donner Colony" is similar but more like electro Chrome. If they ever make a movie out of the old video game Asteroids then "Double Vision" would get my vote for the soundtrack song. Great for the battle scenes. And speaking of battles, "Take The Stones" has got to be the ultimate video game-era space rocker. You'd better be strapped in, alert, and a good pilot and sharp shooter or you'll be blasted out of the cosmos by the enemy aircraft. In summary, Scattered Planets will easily appeal to fans of heavy space rock along the Pressurehed, Chrome, and even Hawkwind axis. The songs are typically short, but McMahan proves to be adept at writing structured tunes, and while the music is all electronic guitar fans won't miss them at all. McMahan's gear produces music that is sufficiently rocking and heavy that you'll be head bopping along throughout the disc. A good fun set of tunes. Recommended. AI: Scattered Planets is the third band of yours I've encountered. Though all are a bit different, space rock influences like Hawkwind, Pressurehed, and Chrome are powerful throughout all three. Are these the kinds of bands that have most inspired your music? I hear industrial/new wave influences as well. Doug McMahan (DM): I'm definitely influenced by Space Rock, especially Chrome and Pressurehed. I was an 80s kid, so new wave was a given, but I had a tendency to gravitate towards the weirdest music I could find. I have always been into sci-fi so any band that combined synthesizers with futuristic themes was certainly alright in my books. Somehow, I also got hooked on Psychobilly somewhere along the lines too. AI: Your web site history also lists the earlier bands Gouge and Braindead Genius. What were these bands like? DM: Gouge was the first rock band I was in. We started it in the late 80s, it was very dark punk rock with guitars, bass, twisted vocals, drum machines, and midi keyboards. Although the music might not suit most ears, I have a soft spot in my heart for it. Gavin and I learned how to play our instruments and write songs as the band progressed. Chris was always a machine gun guitarist, so that was a constant pretty much. Scattered Planets probably sounds more like Gouge than any other band I've been in. Braindead Genius was a transition between Gouge, Guild Navigators, and Escape Velocity. This band went through many transformations over the few years it was together. We wrote some really great songs in that band, especially when Gavin and Chris were in it (the two other main members from Gouge and Guild Navigators). I first started Braindead Genius in Chillicothe and then carried the name along with me when I moved to Dayton. The Chillicothe version was much more heavily rooted in punk rock (expect nothing less when Freak Spacely is in the mix) and the Dayton regime had a serious surf-psychobilly vibe going on (á la Gav on the ultra reverbed guitar). Unfortunately, we rarely went to the studio during any of the stages and only played a total of 2 live shows. Many of the Braindead Genius songs were resurrected by Guild Navigators, Escape Velocity, and Scattered Planets. A few songs from both of those bands appear in the Guild Navigators Phase I CD (see review this issue). It's basically a compilation of music we did from Gouge until the first mid Guild split (when Escape Velocity started and Guild Navigators set up shop back in Chillicothe). DM: The Drinking With Aliens CD was just myself and all the androids I hang out with. I've been jamming with Bob Lennon on the guitars lately which has been adding a lot to the total sound. I never really intended Scattered Planets to be a completely electronic band to begin with and he has brought in new songs and great ideas that will help create a meaner, less gentler, Scattered Planets. Perhaps we'll shanghai more unsuspecting souls soon. Until then we will continue to enslave innocent little robots. As far as my live setup, I enclose myself behind a shield of various semi-functioning keyboards, a very large margarita, and origami sculptures. AI: As several of your bands were located here in central Ohio, I'm curious as to the success you had with live performances with your various bands. AI: The music on Drinking With Aliens is dark and intense, but the album title and certainly the alien on the cover indicates quite a bit of humor. Intentional? DM: Sometimes deep space hysteria can be downright hysterical. That's entirely why I put warnings on the labels, I wouldn't want anyone to get hurt. AI: Your web site has a page where you're creating some sci fi themed computer games. Are these intentionally tied into the music in any way? A lot of the sounds I hear on the CD have a definite video game sound to them. AI: Do you make your living as a programmer? DM: I design call centers for a living. Its not as hip as designing video games, but its fun as hell and pays the bills so I can waste the rest of my time designing bad videogames, twisted music, and psychotic origami sculptures. AI: Are we really - as the song title goes - "Slaves to the Machines"? DM: Individually.... maybe not. Society as we know it certainly is. We have become completely dependant upon machines. I don't really think this is a bad thing, just an observation that humans are no longer in control of themselves. AI: Have you embraced technology or is it simply a tool or means to an end? DM: I don't think technology is moving fast enough. We should be much more futuristic right now. There are so many problems with the world that can't be resolved. Most of our concerns are supply and demand.... too many people, not enough space or resources to keep them happy. The answer to all of the world's problems is expansion. There simply isn't enough room anymore. We need to colonize and pollute other worlds, letting all the little factions of our planet have their space. Of course, this is currently impossible. AI: Having recently relocated from central Ohio to Philadelphia, are you finding like-minded musicians in your new town? DM: Philadelphia and the surrounding area has a really interesting music scene, and even some cool space rock bands (Alien Planetscapes, Sloterdijk, Akash, Temple of Bon Matin, Born to Go, and many others all within a one hour range). It's the first place I've ever been where I can say things like "Hawkwind" and people will usually know what I'm talking about. I haven't actually met many people directly into most of the music that I am, but synthesizers and electronic music in general are warmly embraced. I've been keeping my mind open as well and have been exposed to many cool scenarios I never would have known about if I didn't decide to move out here. I feel more at home here... I was an alien in Ohio. AI: Your web site mentions a festival you performed at. Was there a musical theme or a variety of styles represented? DM: It wasn't really a rock festival. Scattered Planets was the closest thing to a live band at the festival that I'm aware of. It was primarily djs, techno music and stuff like that... some pretty innovative sounds though. I digged it. The festival is an affiliate or extension of the Burning man, with lots of 20-something hippie types, fire, visual art, and crazy themed camp-sites. There was definitely a cool vibe there. Plus culture shock does a body good. AI: Any current activities or future news we should know about? DM: We're going to start playing live shows soon while working on the next Scattered Planets release. I'm planning a few collaborations with my old bandmates Gavin, Tom, and Spacely in the near future. Freak Spacely and I are working together on the Amblifire Record label. The rest I guess will all be a blur.